Scientists have discovered that the neurons of the brain connect with each other in very specific geometries, building up to eleven-dimensional structures or cliques. In 2005, the scientists at Brain Mind Institute at the Ecole Polytechnique Fédérale de Lausanne (EPFL), in Switzerland began what was called the Blue Brain Project to create a working computer simulation of the human brain by starting with an initial simulation of the neocortical column of a rat’s brain. This heterogenous structure with its 10,000 neurons and 30 million synaptic connections is the most complex area of the mammalian brain. The virtual neuronal circuits were tested by simulating specific input stimuli and seeing how the circuits behaved when compared with those in biological experiments. After a process of intensive and continual testing and refining, the simulation reached the point in 2015, where the team was confident that their virtual neocortex behaves like a physical neocortical column. They hope to complete the project of reverse-engineering the entire brain within ten years. Their ground-breaking research used algebraic topology (a sub field of the study of the global properties of spaces that converts topological problems into algebraic problems) for the first time in neuroscience. Through it, they have been able to reconstruct the hidden, constantly changing structures and spaces of the brain’s networks. The team described it as being like a telescope and microscope at the same time – like being able to zoom into and study the trees in a forest (structure) and the clearings (empty spaces) between them at the same time. 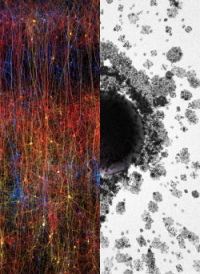 In their study, published in the journal Frontiers in Computational Neuroscience, they have discovered the formation of “multi-dimensional geometric structures and spaces within the networks of the brain”. The complex mathematics showed that while the cells of other organs work in three dimensions – i.e. 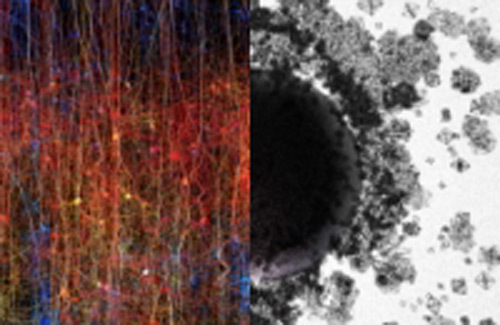 the three spatial dimensions and one of time – those in the brain work in different dimensions, generally seven but up to eleven, “creating multiverse-like structures that are a world we never imagined.” Presented with a stimulus, a set of neurons connect in a specific way to form a clique, which is generally four dimensional. The cliques then connect in ever-increasingly complex geometric structures, up to eleven dimensions, with higher dimensional cavities that appear to be vital to the processing of information, being created within these formations. It thus appears that the brain processes information in an extremely organised and intricate manner as these complex structures are rapidly created and then disappear. Ran Levi of the Blue Brain Project describes it: “as if the brain reacts to a stimulus by building then razing a tower of multi-dimensional blocks, starting with rods (1D), then planks (2D), then cubes (3D) and then more complex geometries with 4D, 5D, and so on.” The researchers are considering the possibility that the increasing complexity of the “sandcastles” thus formed may have something to do with the “intricacy of the outcomes”, and they further speculate that the cavities formed may provide a clue as to how memories are stored. “They may be “hiding’ in high-dimensional cavities,” postulates Henry Markram, director of the project. They will also be looking at the involvement of the cliques and cavities in neuroplasticity, the brain’s ability at any age, and even after devastating injury or disease, to reorganise itself by forming new neural connections. In the Glossary, The Keys of Enoch® defines man (woman) as “… a biotransducer processing the “thought-forms” and “light signals” for higher intelligence …” and this research is a beginning in our understanding of how our brains work to process higher dimensional stimuli by building multi-dimensional geometric structures in the process.